My first blog of the year! Very late I am sorry to say, but in January my laptop decided to die and I’ve had some trials and tribulations with new laptops and Windows 10 issues. Anyway I am back on track now. I wanted to share with you the final edition of the Squash screenprints that I created last year at City Lit. My final set of prints looked like this; but I was not completely satisfied with the way the squash outlines got lost in the background. I decided to edit the prints to create a smaller image that focuses on the small round squash. It was quite hard to decide to do away with the rest of the print because I had put so much work into producing it. I think that is always a moment of struggle for all artists, knowing when to discard work even if you feel greatly attached to it. I should mention that I sat on the decision for months! I lived with the idea before executing it. I think you have to guard against rash decisions that you might regret. Time passing allows for a fresh perspective. I am very happy with the edited images, which I have backed onto A5 card. They are for sale via my Artfinder shop. Autumn has arrived in this colourful print of oak leaves and an acorn. Actually there are two timelines in this print, the green acorn and green leaves of the summer, and then the hint of autumn change with the leaves turning orange and a blustery sky. I love the shape of oak leaves and the beauty of the sun shining through them especially when their colour is changing. 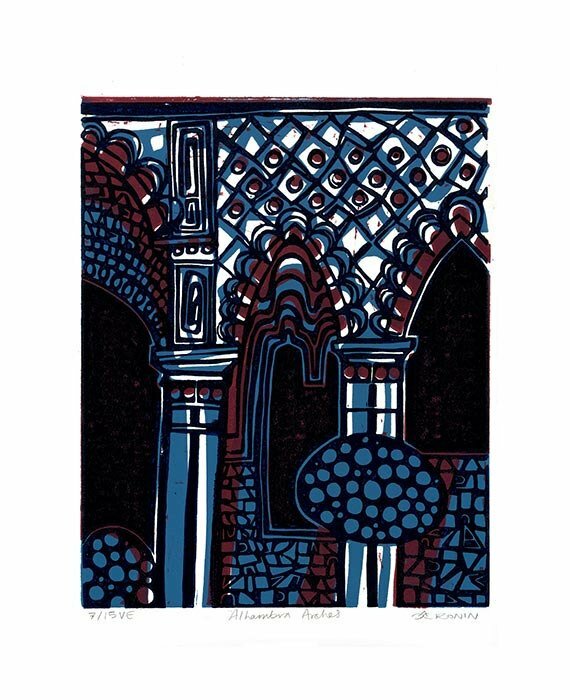 This linocut is a 6 colour linocut, created from three blocks which printed the first three colours; and then each block was further cut to remove more material and then these were used to print the last three colours. 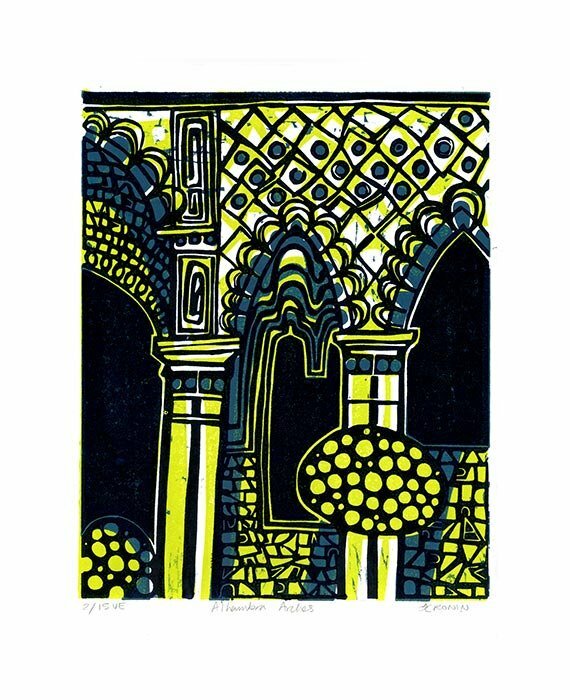 This method of printmaking is known as a multi-block reduction cut; and it means the edition cannot be printed again as you no longer have the earlier stages of the blocks to print from. Printed by hand using Caligo relief water-based ink on specialist printing paper, Zerkall 210 gsm. The yellow highlights on the leaves and stems were hand coloured with acrylic ink (making the seventh colour in the print). This edition has 15 prints in total and it is available in my Art Finder shop. Here is a gallery of rough proofs for each colour printed. I’m using Caligo Safe Wash Relief inks to print my ‘Oak’ linocut. When it came to printing the dark green layer defining the acorn and its leaves I found the mix of phthalo green and phthalo blue ink was really slippery, it didn’t roll out like ‘velvet’ and I didn’t get that ‘kiss’ sound between the rolled out ink and brayer. I tried to print with it and found it was filling my cut lines and blobbing on the cut edges of my lino block. After researching the web, the solution that kept coming up was to add magnesium carbonate to the ink, which would ‘stiffen’ the ink up. I found that art branded magnesium carbonate is expensive and sold in a large quantity. Instead I bought 50 grams of magnesium carbonate via ebay, from a company that sells it in a pure form for use in food products, cosmetics and a variety of other applications – who knew! I added half as much magnesium carbonate to my ink and mixed well. The result was a stiffer ink that rolled out like velvet and didn’t clog on my lino block. I recommend giving this a go if you too are struggling with slippery ink. I carried on my recent screenprinting adventures by signing up for a second course at City Lit. This would consist of 5 sessions, 3 hours long. 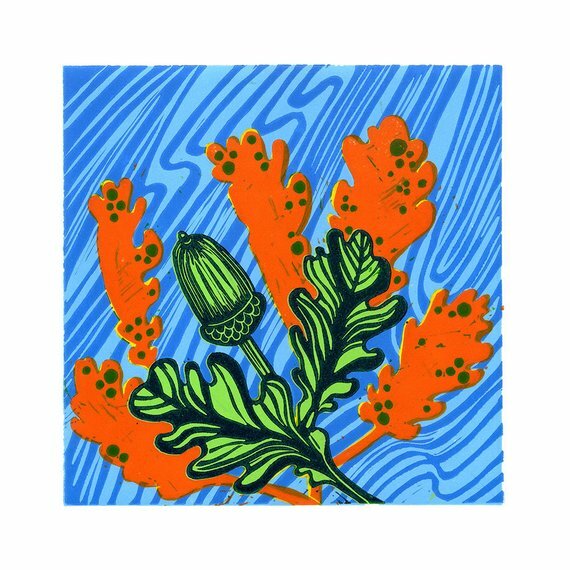 This time I wanted to try to get away from thinking about printed layers as in a linocut print; which is sort of what I did when I made my flower screenprint. 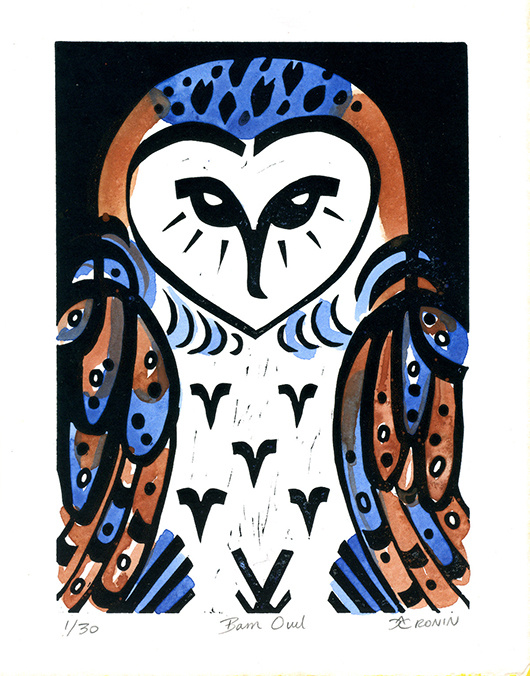 Though I am pleased with that result, I wanted to explore more what screenprinting can do as its own medium. Two things I was interested in exploring was painting into the screen and pulling monoprints, and making a halftone photo-stencil which would convey tones. I wanted to use my recent squash watercolour work for my photo-stencil. I combined in Photoshop a collaged image that showed a range of tones as grayscale and so should work as a halftone image. Halftoning is where the image is made up of a variety of dots, similar to printed newspapers. The final image below in black and white is the image I used to make a halftone photo-stencil. For the first layers of my screenprint; I combined painting into the screen and pulling monoprints; and then using a paper stencil to print a slightly transparent teal colour on top. This meant that all the backgrounds would be slightly different. I really like these backgrounds, but I was worried that as they have strong colour and bold shapes, my squash photo-stencil would get too lost when printed on top. In screenprinting to get an opaque colour you need to add white, which makes it difficult to get strong opaque dark colours. I wanted to print my photo-stencil in red; below is a screenprint of just the stencil on its own; and then printed in red on top of my printed layered background. I admit I was disappointed, I did think that the red squash did not jump to the foreground enough; so I switched to the darkest and most opaque ink – black. I printed my series in black ink; but on reflection I now think I prefer the red inked squash! I would be very interested to know your thoughts on these final images? 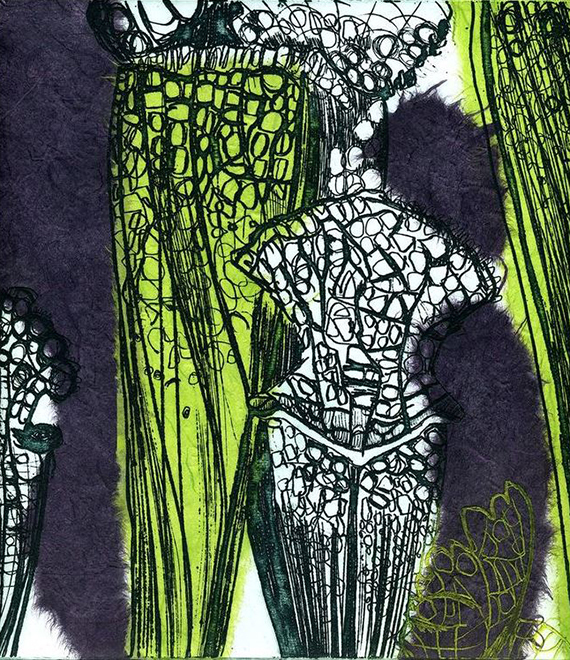 I have really enjoyed screenprinting and I think it suits my figurative style of drawing, especially when combining monoprinting, paper stencils and photo-stencils. I look forward to continue to work with monoprinting and paper stencils in my home studio; probably combining with linocut printing too. On Monday I paid a visit to the Serpentine Pavilion for 2017 by architect Francis Kéré; and I planned on seeing the Grayson Perry exhibition in the Serpentine Gallery too, but it was closed! I really liked this years pavilion; on a smallish scale compared to previous years it is a friendly and domestic space. The repeating triangular patterns in roof and walls is very effective; and apparently if it rains the cleverly sloping roof would bestow a waterfall into the middle of the structure for those inside in the dry to admire. I urge you to read more about the design on the gallery’s website. To get to the Pavilion I entered Hyde Park through the gate near Lancaster Gate Underground Station; through which you are met with the wonderful sight of the Italian Water Gardens. This garden is 150 years old and believed to be a gift from Price Albert to Queen Victoria. Still all about the squash. Drawn outlines in marker pen with watercolour washes.